Horror Movie A Day: HMAD Screening #3!! It's a few weeks off, but let's start getting the word out NOW! In association with Amoeba Music and the New Beverly, Horror Movie A Day (so, me) is proud to present the next midnight screening, on Saturday, March 6th This time the flick is TERROR TRAIN, which stars Jamie Lee Curtis, the great Ben Johnson, Hart "Ellis" Bochner, and yes, DAVID COPPERFIELD (as, big surprise, a magician!). And, just like Shocker and Dr. Giggles, featured a franchise-ready villain that never got to appear in a sequel. I guess that's my theme. Special guests might be a bit hard (Director Roger Spottiswoode says he is embarrassed by it, Copperfield plays Vegas every night, Johnson is dead, Bochner won't talk about it, and Curtis "reportedly" doesn't like talking to fans about her horror films), but we'll try. But even if there aren't any special guests, the night will be special anyway. Why? It's my 30th birthday! OK in truth my birthday is two days before, but close enough, and even if I wasn't hosting the screening I'd be going to the New Bev to celebrate anyway. So come on down, I'm sure we'll have some cake or cookies or something along those lines. Mmm, cake. Drat! I just watched it last night. Well, I half watched it. I could stand seeing it a second time, if just for the super awkward David Copperfield. If I were in L.A. and no other special guests were forthcoming, I, as the world's leading expert on Canadian horror movies and a friend of the late Tom Drake (the TT screenwriter), would happily volunteer to introduce the movie. "World's leading expert" sounds is a pretty grandiose claim, I realize, but I did write a book on the subject, so it could well be true. Anyway, great choice and best of luck with the screening! Hopefully you're not making Theresa bake 200 cupcakes. 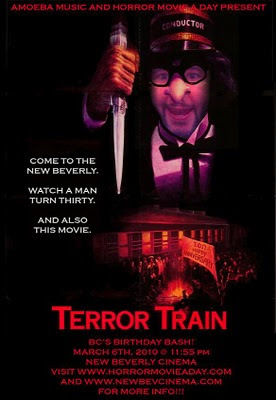 I love Terror Train! In a concealed flask, yes. No glass bottles.